This affordable green game offers plenty of fun and education. The Plan Toys Plan Preschool Alphabet A-Z won a Best Green Product from Dr. Toy’s Guide and it’s easy to see why. Children can use this set to learn how to recite the alphabet, letter-names and identify letter-sounding relationships. Additionally, little ones may match up alphabet letters with the animal picture base and helps small hands develop fine motor skills. The set comes with 26 capital letters and 2 side bases. The front base has animal pictures which relate to a corresponding alphabet letter. On the back are directions for writing the alphabet. Like all Plan Toys, this set is made with chemical free, kiln-dried recycled rubberwood and designed with water based non-toxic colors, plus comes with a reusable storage bag. This affordable green game offers plenty of fun and education. The Plan Toys Plan Preschool Alphabet A-Z won a Best Green Product from Dr. Toy�s Guide and it's easy to see why. 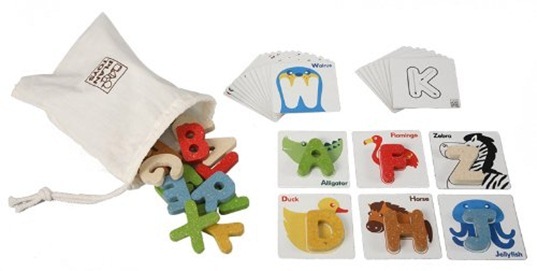 Children can use this set to learn how to recite the alphabet, letter-names and identify letter-sounding relationships. Additionally, little ones may match up alphabet letters with the animal picture base and helps small hands develop fine motor skills. The set comes with 26 capital letters and 2 side bases. The front base has animal pictures which relate to a corresponding alphabet letter. On the back are directions for writing the alphabet. Like all Plan Toys, this set is made with chemical free, kiln-dried recycled rubberwood and designed with water based non-toxic colors, plus comes with a reusable storage bag.